We have all heard the debate about actively managed fund managers versus passive index trackers. Sure, there are benefits and drawbacks of both strategies, but it is important to quote the right numbers when trying to make a point. My aim with this article is not to advocate for any side of the debate, but simply to correct some of the numbers that those making the debate often get wrong. "Active fund managers underperform the index." Simply referring to active fund managers in general has several flaws. There are many different strategies out there, and while they are all classified in the (ASISA) South African Equity General sector, they are often not comparable. Some fund mandates allow for 25% offshore exposure while others are confined to just investing in SA equities. There are several investment styles focusing on either momentum, value or even rules-based approaches like smart beta strategies. Many of these funds are specialist equity funds, and are not even considered by the individual investor when browsing for an equity unit trust investment. Quoting figures involving these fund managers could skew the results. There are many ways to measure performance, but return seems to be the overwhelming favourite during active vs passive debates. Personally, I would like to know that the return I’m getting from my investment wasn’t due to excessive risk taking by the fund manager. To put it simply, if an actively managed fund lags the market index by 1% per annum, but gives me a lot less volatility in my returns, then I would consider it a better investment. Something like the Sharpe ratio is a good indicator as it incorporates both return and risk/volatility in the measure. It would be interesting to see how active managers compare to indices when using risk-adjusted performance as the measurement, so look out for a future article on this. There are so many indices out there, it should be specified which one is being referred to when making this type of statement. For example, the returns from the Top40 Index and All Share Index can be substantially different, and the All Share Index has lower volatility due to the higher number of companies tracked in the index. Fund managers often adjust indices with a cap on single shares to use as a benchmark to reduce company-specific risk. I covered the shortfalls of indices as an investment in an earlier article, which you can read here. Now let’s assume you only want to quote the returns of funds compared to the index. It’s simple to understand and can give some insight in a debate, but there is one mistake that everyone always makes and that is that they are comparing apples with pears. It makes no sense to compare a market index like the All Share Index to a unit trust, because an investor can’t invest in an index. Actively managed funds need to pay platform and admin fees that make them available to investors. Indices only quote performance and completely ignore the fees that an investor would need to pay. That is why using a passive fund like the Satrix Alsi Tracker is the only accurate way to measure performance of the All Share Index versus actively managed funds as both are available to investors and include admin fees. Let’s consider the figures for five years, since this is the minimum investment period recommended for most equity funds. When comparing equity funds to the All Share Index it has been correctly quoted by previous articles that only 25% (29 out of 117) of these funds managed to outperform the index. However, as stated earlier in this article, this is not a fair comparison. A more accurate comparison using the Satrix Alsi Index Fund reveals that about 34% (40 out of 117) of actively managed equity funds outperformed the Satrix Alsi Index Fund over a five-year period. The active versus passive debate has received a lot of attention, especially considering how topical fees have become in South Africa. It’s important to know exactly what figures are being quoted by those involved in the debate and what the shortfalls of these numbers are. The returns quoted in this article are net of all fees. 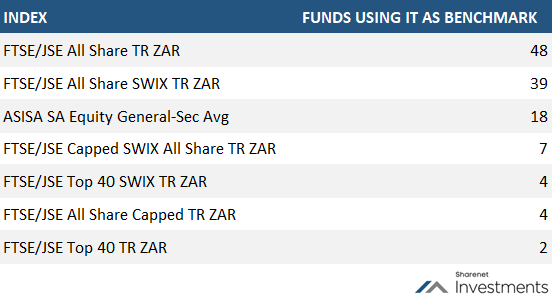 Approximately 34% of equity funds (excluding tracker funds) in the (ASISA) SA Equity General sector had higher return than a comparable All Share Index Fund over a five-year investment period. This statement is specific and tells the listener exactly what is being quoted. I would encourage anyone who wants to take part in the debate to use the above statement. It only focuses on the return aspect of the funds, however, and I believe that volatility/risk should also be considered when measuring performance. This is a theme that I will continue to explore in Part 2 of this article.